So much to blog, so little time! I'm sorry I've been delinquent, and will try to catch up with posts I've had planned for a while, as well as yummy new experiments. I'm back to full low carb/ketogenic eating (getting there, anyway) and so I've returned to my fully sugar-free ice cream recipe. I am keeping the milk option, from my more recent recipes, because I love the lighter texture (more like gelato). See note at the VERY bottom for a comment on the milk/cream situation. I'm still working my way through my Jeni's ice cream recipe book, taking inspiration and trying to convert these to sugar free. I can't say enough good things about this book though! 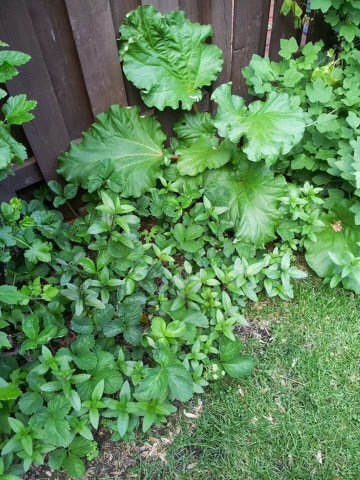 Last year, I planted chocolate mint in my garden (you can see it here with the strawberry (dark 3-leaf), rhubarb (massive leaves), gooseberries (left, top) and red currants (far right) earlier this year). The mint has pointed oblong leaves that grow in pairs. Beware: mint grows like a weed (it sends out runners) and can easily take over the garden. I'm ok with that! It's doing well, and I thought-- hey! 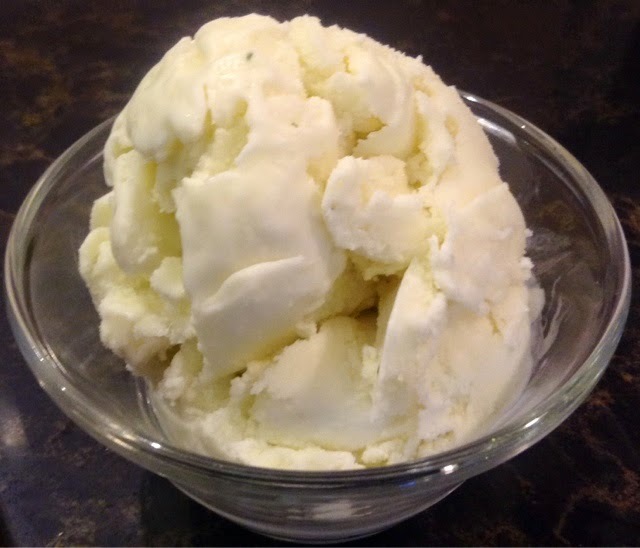 My husband loves mint ice cream, and I haven't made any yet this year. And gee, look at all that mint... I'll make it with fresh mint, instead of extract! So I found Jeni's recipe for "Backyard Mint" ice cream and gave it the de-sugarification treatment. I waited to tell you about it until I could try it after a full 24 hours in the freezer, and I do declare, it is a success! You can give this a whirl with other herbaceous, um, herbs. I think Tarragon would be great (I had that once in a restaurant, along with a warm chocolate cake), or maybe Basil? So think of this as a technique, and you can play with it. As always-- to make sugar-free ice cream scoopable, you'll need some combination of the following "specialty" ingredients-- you can find all of these online, and most at your local stores (cake decorating supply stores would be your best bet for glycerine and isomalt). Vodka - helps with freezing temperature (the faster something freezes, the smaller the ice crystals, and the smoother the texture). Isomalt syrup: I use this instead of corn syrup, which adds to texture and not freezing too firmly. You can read more about it in my Pecan Pie Tartlet recipe on FluffyChix's blog. So, go gather yourself a BIG HUGE bunch of fresh mint (peppermint, not spearmint... unless you like spearmint. Which is fine. You can do that. But it's not my thing... #ew). 1-2 bunches of fresh peppermint (I harvested about 10-16 sprigs from my garden, and just used the leaves, but you can use the stems too, since it all is strained out). We like things minty. In a medium heat-proof bowl, mix the glycerine, vodka, and salt. Prepare a HUGE bowl with ice and some water (you'll cool the medium bowl in the big bowl later). Wash your mint well, and then rip the leaves into smallish pieces (you're exposing the mint-yummy-cells to the mixture that will be poured over it) and put it in the bowl with the glycerine mix. In a 4-quart (um... 4 liter) saucepan (because this bubbles up... bigger pot is better), mix the milk, cream, salt, xylitol, isomalt syrup, and heat over medium-high until it hits a rolling boil. Boil the mixture for 4 minutes. Remove from heat for a moment, and mix in a few shakes of your guar/xanthan gum thickener (one/both/either whatever you usually use). You don't want it too thick, or your machine will have trouble freezing it. No more than 1/8th tsp. I shake mine from a "icing sugar" type of shaker, so it's not even that much. WHISK VIGOROUSLY while you are adding the shakes of the thickener, or you will get clumps! Return to the heat and boil for 1 minute (less if you sense it will boil over). Pour a small bit of mixture at a time, over the ripped mint/glycerine mixture in the bowl. Stir everything together. Place the bowl into the big bowl of water/ice (don't let any water get in! ), and give that a stir every few minutes until it is cool. You can then place it in a covered container in the fridge, up until a full day. It will just get mintier. I used mine as soon as it was cold because I'm terribly impatient. Strain through a sieve, pressing to get all the liquid, and don't forget to clean off the outside of the sieve too. Freeze in your ice cream/yogurt maker according to directions-- should take 25 minutes, give or take a few. Quickly transfer to your container for the freezer, smooooooth it out, and get that in the freezer QUICKLY. Let it firm up for a few hours, 2-4 at least. And VOILA! Best mint ice cream ever! A few flecks of mint leaf got through, but you wouldn't call this green by any stretch of the imagination. You taste the "sweet cream" aspect, and the fresh mintiness, and the herbal quality comes through too. If you use whole milk, there's 232 calories, and 78% from fat (getting better for the Keto folks). You can play with the milk/cream ratio if you like-- just keep in mind that more fat means that your tongue gets coated and you don't taste the flavors as much.